The process of designing a computer program uses the TEKS Process Standards. Problem solvers need to understand their answer [OUTPUT] is dependent on the data (usually numbers) that are in the problem [INPUT]. But the way the problem is solved [PROCESS] can be the same. They need to explain the process they used in solving the problem, justify their answer [FEEDBACK], and make up examples with different input but the same goal. These are mathematical ideas being expressed and communicated through a computer program. See the Design Recipe Examples from my Computer Science lessons. Input: Ask students the goal of the maze. Ask what commands they use in the puzzle. Process: Design an example by walking with body or fingers. Say or write the steps to solve the puzzle. Output: Code the program and click run. Feedback: Were you successful? If not, debug the code by studying the location of the Angry Bird and where it should have gone. When successful explain how the puzzle was solved. Input: Ask students what they want to draw. Ask what commands the artist can use. Process: Draw an example on paper. Say or write the sequence of steps to draw the art. Feedback: Did you draw the correct object? Do you like what you drew? Can you improve the art? Can you draw the same shape, but make it larger or smaller? Explain how you designed and created your art. 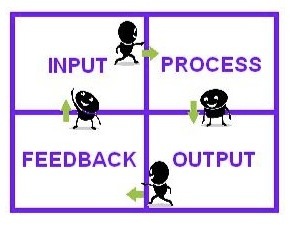 Use the same 4 step process when students are solving a math problem. Make connections to the puzzles or artist to reinforce the steps. Teachers should create/assign sets of math problems that can be solved using the same process so students see the pattern involved. Math students would benefit from studying computer science because it helps them see a systematic approach to designing and testing a potential solution. See “Plan by Design” for More Examples and Implementation Links. Sometimes you have to fail to succeed. But only if you loop back around and study what went wrong, and what needs to be changed. Chapter 111 (a)(2) Process Standards are the same in all grade levels. Process standards describe ways in which students are expected to engage in the content. Weave Knowledge & Skills to be successful problem solvers. Use math efficiently and effectively in daily life. Apply math to problems arising in everyday life, society, and the workplace. Select tools such as real objects, manipulatives, ALGORITHMS, paper and pencil, and technology. Select techniques such as mental math, estimation, number sense, GENERALIZATION AND ABSTRACTION to solve problems. Communicate math ideas, reasoning, and their implications using representations such as symbols, diagrams, graphs, COMPUTER PROGRAMS, and language. Use math relationships to connect and communicate math ideas. Display, explain, or justify math ideas and arguments using precise math language in written or oral communication.